I don’t know why, but the color of red beets continues to excite me. 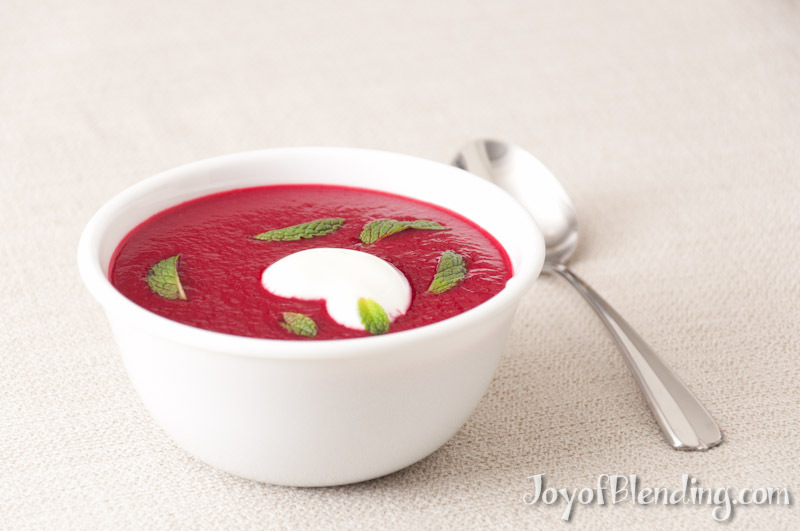 And their flavor is good too, so here’s a quick Vitamix beet soup recipe. One of the great things about making soup with a Vitamix is that you can get it silky smooth without straining. 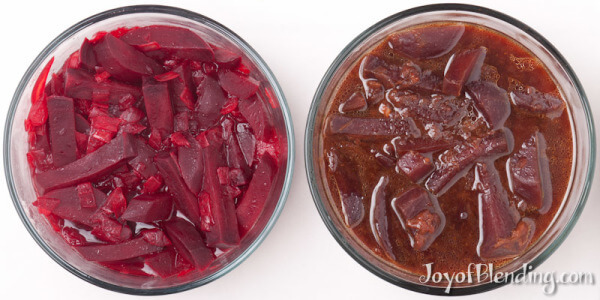 I did a side-by side comparison with simply cooked beets and a more complicated method, but the simple method was better so I will describe it first. See the end of the post for a description of the less tasty experiment. I decided to speed up cooking the beets and onion by using our pressure cooker. I usually only use it to cook beans (for example for hummus), but it’s handy for vegetables as well. Previously I’ve oven-roasted beets in foil, but that can take an hour. Cutting up the beets makes them cook even faster, and since this is for a soup, we don’t need to keep the beets intact (usually it’s nice to leave the skin on to retain the juice for maximum flavor, but in this case, all the juice is going into the blender, so it doesn’t matter). Makes ~3 cups: 2 large servings or 4 medium. Peel and then coarsely chop the onion and beets (½” by ½” sticks is good for the beets). Heat pressure cooker pot, add oil, sauté onions on medium-high heat for ~1 minute, then add beets and ½ cup water. Seal and bring to full 15 psi pressure. Reduce heat and cook 3 minutes at pressure, then quick release (with cold water in sink). Allow to cool for at least 5 minutes, then transfer to blender. If you want a really thick soup, you don’t have to add any more water (at least with a Vitamix), but I would add at least ¼ cup of water. Blend on high until smooth, ~40 seconds. Salt to taste, then serve, garnish, and enjoy! Many recipes use broth instead of water or add potatoes, but this recipe is quite good with just the beets and onion. This soup is good both hot and cold. It goes well with some sourdough bread. While searching around for hints on pressure cooking beets I came across a carrot soup recipe that sounded interesting. If you add a little baking soda you can brown the carrots in a pressure cooker relatively quickly and develop interesting flavors (via the Maillard reaction). I also found some discussion of applying the same principle to onions, but much less discussion of beets. I prepared the browned beets the same as above, but added 0.5% baking soda by weight, which came to just about a teaspoon. Then I cooked for 20 minutes at full pressure instead of the previous 3 minutes. The browned beets had an interesting browned smell, whereas the lightly cooked ones smelled more like beets. I was surprised that blending brought the bright red color back to the browned beets. There was still a detectable difference in color, but it was much less pronounced than before blending. I regret that the lighting in the photo above is not perfectly uniform, but you can still see the slight difference in color. The first bite of the browned beet soup was tasty. However, after subsequent bites a bitter aftertaste built up that was ultimately unappealing. Even in the 50-50 mixture, the bitterness was too much. The shorter-cooked non-browned beets were not only less bitter, but they also retained some pleasing fresh beet flavor that was lost in the browned beets. I wondered if the browned bitterness was from the baking soda, so I added some lemon juice to try to neutralize it. The lemon juice was a nice addition, but the bitterness persisted. It’s possible that I somehow overdid the browning, but the lightly cooked beets were so good that I think I will stick with light cooking in the future. I chose this recipe for a dinner where I was serving quite a few people people I didn’t know all that well. It was easy to make a lot; it was visually stunning and elegant; and it was delicious — the hot version for December. Most people asked for seconds, and it was soon all gone. Not your Grandma’s borscht — even more marvelous. Thanks. Never cooked any soup using beet. It looks festive, so nicely colored, to be tested! I’m curious…in my vitamix recipe book, soups are made with raw ingredients often. Is there any reason the ingredients couldn’t be cut up and put in the blender and blended till hot? It really depends on the ingredients. Onions are best precooked. I once had to throw out a cauliflower soup that I had blended raw cauliflower and raw onion. It was terrible, whereas the same recipe, with the cauliflower and onion precooked, is delicious. I did the same with my first broccoli soup. Raw broccoli was awful vs steaming it first. This soup color is very beautiful. 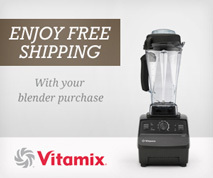 I am a new owner of a Vitamix blender and found your website just today. It’s one of the more interesting sites I’ve come across so far. I tried your recipe for beet soup. At first I thought it was so simple it could not be that good, but because I appreciated its simplicity, thought I’d give it a try. The result was a pleasant surprise! It was absolutely delicious! Looking forward to trying other of your recipes soon. Many thanks for your website! Excellent. So simple, yet so good. This looks great, and I want to try it. I have many beets of various sizes that I pulled at a local orchard. You usually give a weight in grams of ingredients. Can you specify this for the beets please? And have you ever tried this with raw beets? I use raw in smoothies, and the flavor is great, but there are other ingredients. Of course I’d saute the onion. 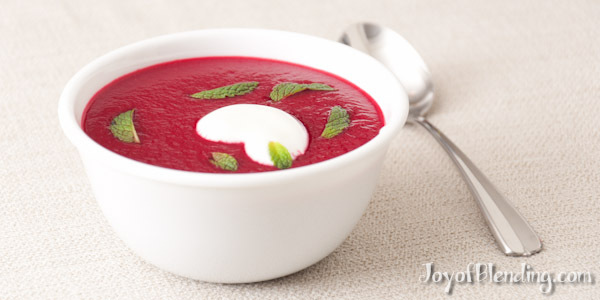 2 medium beets is about 450 g.
I have not tried this soup with raw beets. This soup was wonderful. I added a bit of lemon juice and zest. Thanks for the recipe, and for responding to my question so quickly! Lemon sounds good. Did you end up cooking your beets? Yes I cooked them, roasted in oven since I had time. Also, I kept some thicker puree before adding all the water, for a dip to approximate a beet mousse that my favorite local restaurant serves with vegetable sticks as an appetizer, that I like a lot. It’s pretty close!